We already have our potato bin in place, but that is more of an experiment. The bin is pretty simple in design and function. The bin is 4 feet by 4 feet. We filled the bottom of the bin with dirt to about 8 inches deep. 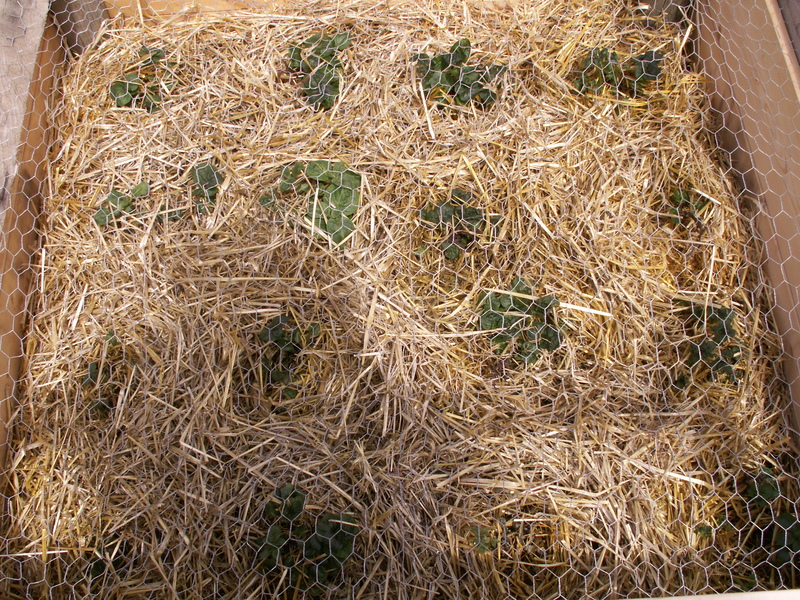 After planting the potatoes in the dirt, we covered the whole bin in about 3 to 4 inches of straw. 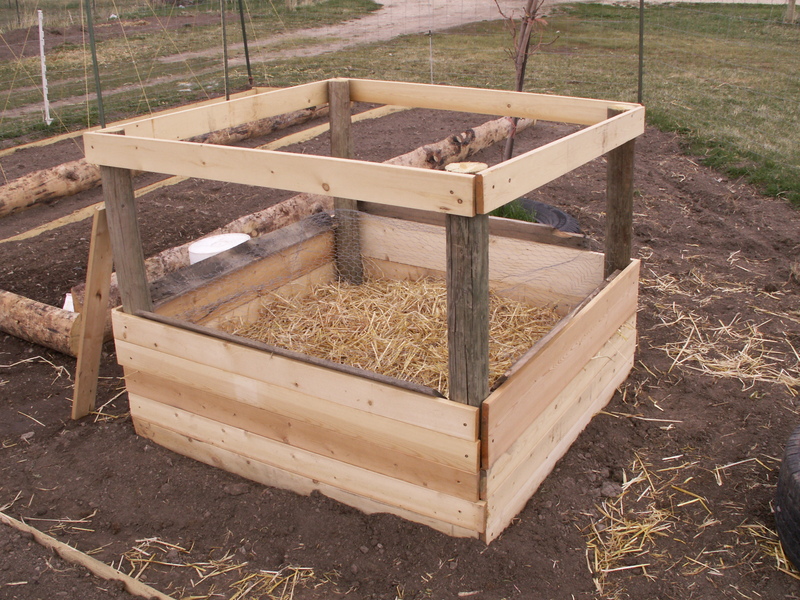 Then we took some old chicken wire and affixed it to some scrap boards to place over the whole kit and kaboodle to keep the straw from blowing away. As the plants grow we will be adding more straw and side boards. The potatoes are supposed to grow in the straw. In theory we will end up with a nice box full of potatoes. We’ll let you know how it turns out. To make sure that we still get a nice harvest of potatoes we are also putting in a full bed, 8 feet by 4 feet. Per usual, we started with our rough cut wood frame. 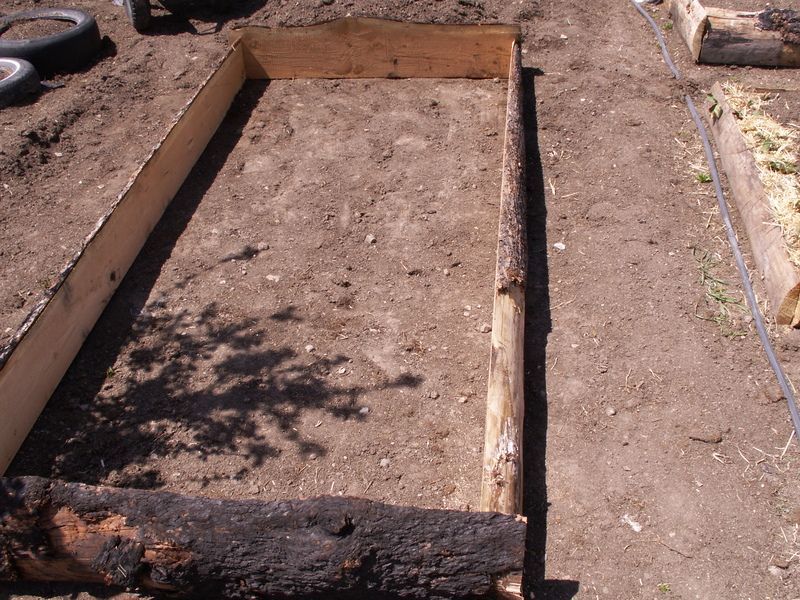 Prior to building the frame we dug down to the hard pack and leveled it off. Then we placed our frame and begun the fun task of filling it up. 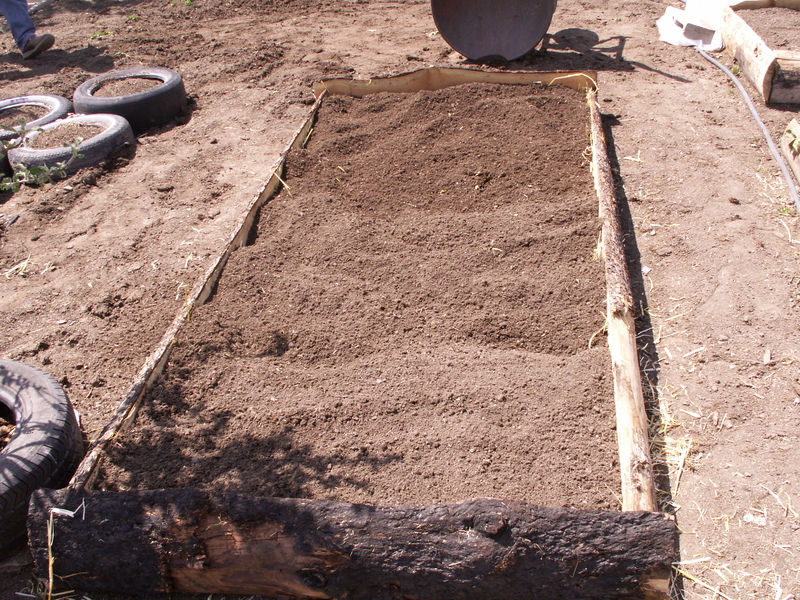 We prefer to use sifted dirt in our beds to help prevent weed growth, but that would be a lot of dirt to sift. So, we just shoveled pre-tilled dirt in until the frame was about half full. 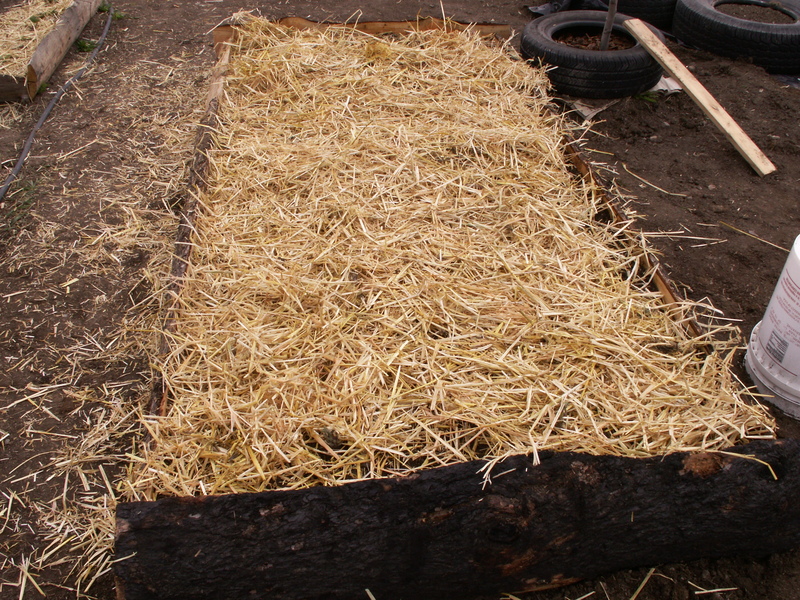 Then we added a layer of straw to help with drainage and hopefully help keep any weeds from making it through. Plus this gave us a little filler to help fill this bugger up. Once the straw was in place we began sifting the dirt and covering the straw. Once the straw was all covered with a couple of inches of sifted soil, we were ready to place the potatoes. Here we used potatoes that we saved from last years harvest. 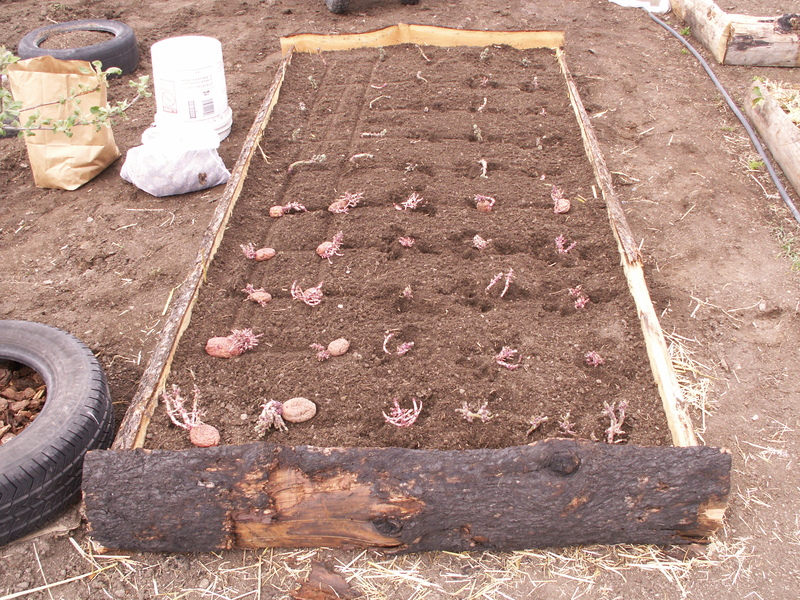 Placing the potatoes about 8 inches from each other we were able to get 50 plants into this 8×4 area. 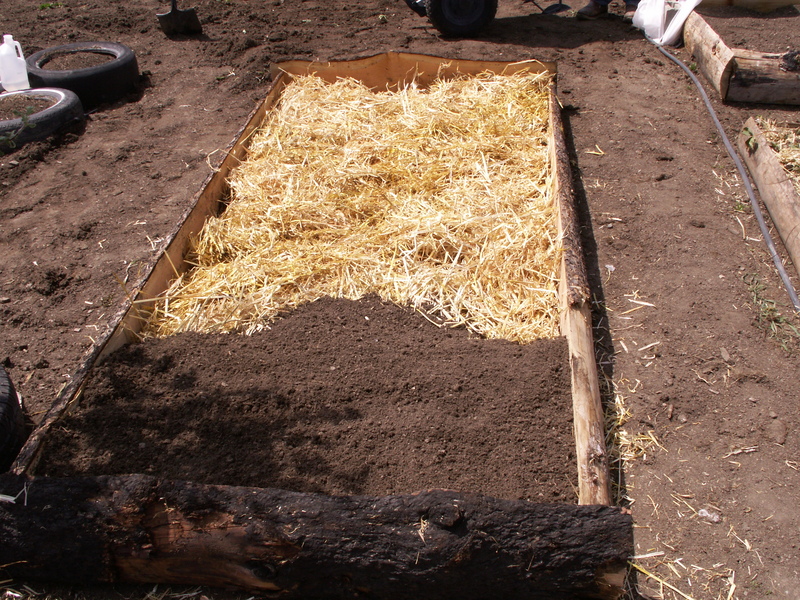 After all of the potatoes were covered with dirt, we then spread a nice generous layer of straw over the whole mess. Soaked the straw with water and called it good. Nice. We had good luck with the few potatoes we planted last year, so we planted a lot more this year — a few Russets, but mostly reds. I am curious how your bin will turn out. I am trying a potato bin for the first time this summer. I’m anxious to see how they do. I built a wood box. Check out my blog for a picture.